Money, money, money, money! Now you can have dollar signs flash before your eyes by decorating with the $ Garland. It's a fantastic decoration for a casino or Las Vegas themed party. Hang it above a table so your guests know where they can trade in their poker chips or use it to decorate a casino themed buffet table. It would look perfect next to a sprinkling of Green $ Fanci-Fetti, the Slot Machine Centerpiece, or a Money Bag Photo/Balloon Holder. And the $ Garland is the perfect decoration when you're trying to raise money for a good cause. String it across the front of or above your fundraising table. This $ garland really makes a statement all on its own! It's bright and quite noticeable when strung across a wall. Love it! 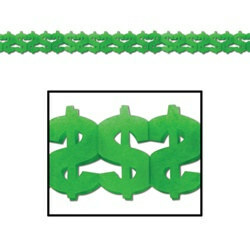 I purchased several of these $ Garlands to place along walls as a border, for a 'Tax Day' luncheon! These can also be used for a 'Casino Night' theme. Looks great. I will be able to use it for a lot of different events.